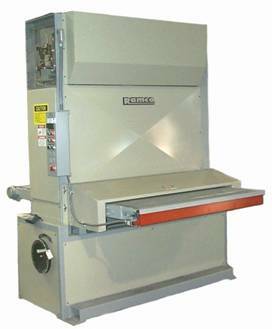 All models available with multiple sanding stations and widths of 13″, 19″, 25″, 31″ and 37″. Standard Features: Rugged uni-frame construction, Electric eye tracking, Automatic braking system, Safety interlocks, and Variable feed speeds. Optional Features: Increased horsepower on main motor (s), Dual purpose polishing platen, Conveyor bed extensions on infeed/outfeed, Constant pass line (stationary conveyor bed), Cleaning brushes, Auto-sizing, and more.